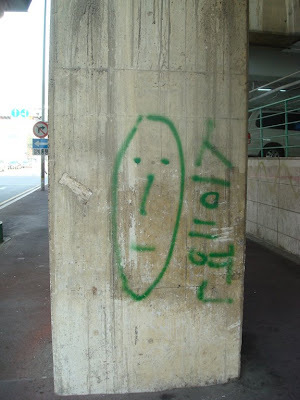 Graffiti in Korea is rare. 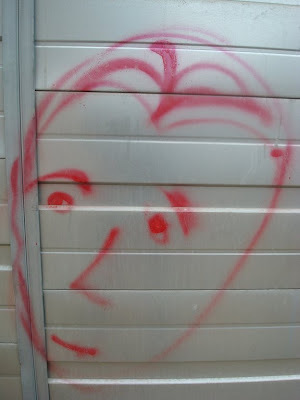 The graffiti that does exist is quite friendly. Hello. My nostrils are handles!!!! I think these two green ones above must be by the same person. What a motley crew! From left to right: bunny rabbit, Jason Voorhees from Friday the 13th (? ), Marge Simpson, Homer Simpson, and a happy tree stump (?). 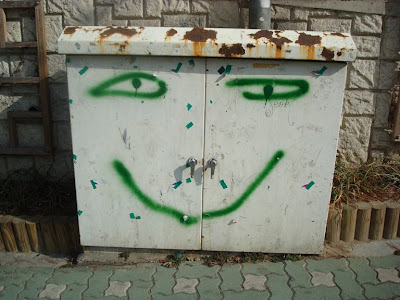 Since graffiti is not a common part of Korean culture, not even in Seoul, there are not many examples to share. Hope you enjoyed these friendly ones. Yeah gafitti art has never really taken off in South Korea. When I came back to Australia after living in Seoul for 7 years, I was surprised to discover that the biggest tourist drawcard in Australia now is the grafitti lanes of Melbourne- apparently even young Asian tourists rank it as their biggest priority to see in all of Australia! In Seoul though, it just hasn't taken off. I think the most impressive grafitti I saw in Seoul was a scrawling quote from Joe Strummer of The Clash across a wall in the arty district of Hongdae. Alex, you're right. Hongdae and some seemingly designated graffiti filled tunnels are the only place I ever see graffiti as art. There is a high level of respect for public property in Korea, so I think that's why graffiti isn't seen very often. (And why it's friendly in the rare occasions that you do, ha ha!) I didn't know it was so big in Australia. There was some odd grafitti in Hong Kong recently -- spray painted on walls around the city was a small image of a baby chick, with the words "cheep cheap"
Oh, maybe that link won't take you there? and that will bring you to the correct category. Helly: A graffiti chick saying "cheep cheap", ha ha! You have to get a picture of that! Alex: Thanks for the interesting links. I've been kind of slow in posting these days, but will get some stuff up soon. it really is hard to find graffiti in south korea. 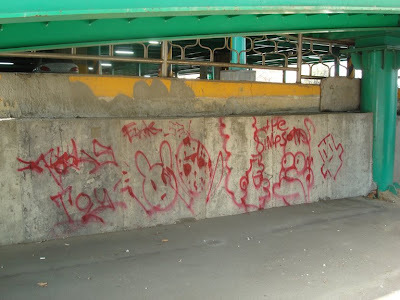 i visited there last summer, and i did find some quite unfriendly graffiti in my mom's country hometown of gunsan (it was more like scribbled profanity, but...)! i was actually pretty thrilled, haha. but, anyway, love the blog.